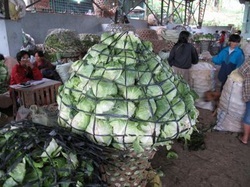 The Mantalongon vegetable market is essentially a “bagsakan” or wholesale trading post. 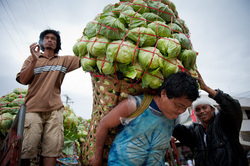 Farmers from the nearby areas load up their harvest of vegetables into HUMONGOUS baskets and make their way on foot to the nearest roadway and head to market in a tricycle or jeep. I was a bit disappointed by the limited selection of vegetables (say only 12-15 types) but the volume of goods changing hands was impressive nonetheless. We were there on a Thursday, the busiest trading day, and the cavernous gym area was only about 2/3 filled with vendors. 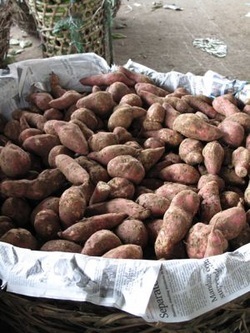 Wholesale buyers from Cebu city arrive in medium sized trucks and load up on vegetables, buying by the basket or lot of 60-180 kilos.Many of the veggies that arrived were “cleaned up” or sorted and re-packed in baskets that were labelled by weight. The native or localized bell peppers were utterly gorgeous… These aren’t as meaty or sweet as the more western style capsicum, but these are delicious if roasted and drizzled with olive oil! 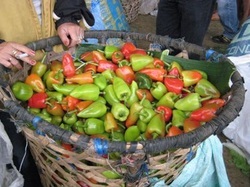 Manatalongon public market is the so called vegetable bowl of Cebu, the weather there is typically reminiscent of Baguio and Benguet. I think the abundance of vegetables growing in the are is pretty much credited to the temperature. While going to the market you'd start to notice that the temperature changes drastically as you wind up the zigzag roads going there. Another thing to point out was the difference of the surrounding trees and vegetation on the side of the road. You start to notice the abundance of pine trees and other trees similar to birch. 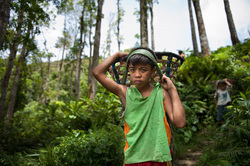 If you're lucky you could catch people hauling huge baskets of vegetables up the mountain path, these baskets can typically reach a weight of 90 to 140 pounds. 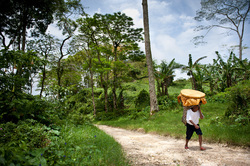 people strap them to thier back as they make way to the market. 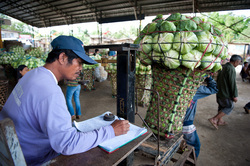 Upon arriving at the market you will obviously be taken by the hustle and bustle of the market. Not your typical market the so called "palenke" is a huge open gym where you can see mountains of baskets filled to the brim with vegetables. The variety of the vegetables were a little bit disappointing for me since i was expecting a myriad of vegetables and there was only about 10-14 different types of vegetables available. What was surprising was the sheer amount of vegetables exchanging hands in the market. As noon arrives the more you'd see people come in with their baskets of goods and the trucks loading the purchased vegetables come and go. The busiest day of the week they say is Thursday and the it was a week end when i went. So far it is still the little Baguio of Cebu. 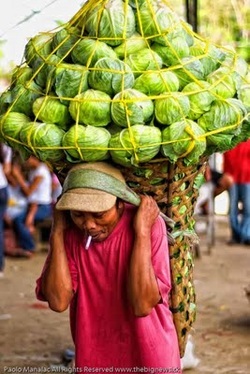 I have heard numerous times now of a mountain town here in Cebu where the weather is cooler and vegetable farmers carry large baskets of produce on their heads. I have always had a small interest in going to see what this was all about, but a part of me never thought it would be too interesting – vegetables are really not that exciting. Again, I was reminded of this place last week when my brother-in-law went on a day hike in the area and showed me some pictures of the farmers carrying these large baskets. I decided I should go and visit the small town of Mantalongon and explore how vegetables are harvested. 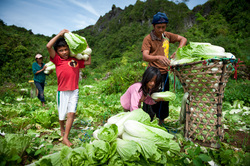 Most vegetables in Mantalongon are harvested every day depending on the time of year and the type of crop. 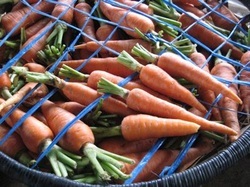 We saw cabbage, pechay, carrots, syote, eggplant, carrots, corn, onions and others during our time there. 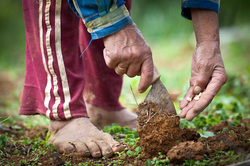 It seems like the majority of the fields are small plots of land managed by individual households. During harvest time community members help each other out, by picking, packing and getting the vegetables to the market about 3-5km away in town. 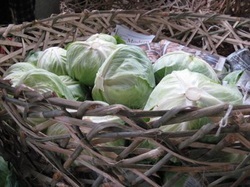 The vegetables are packed into large baskets which are then either placed on a carriers head or back. 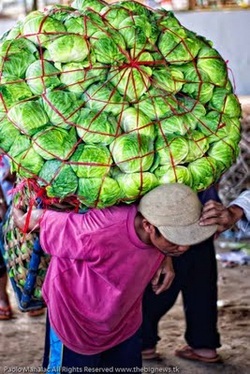 Its seems somewhat painful carrying over 100 kilos of vegetables on your head, but I’m not sure how else they would get the baskets off of the mountain. There are only muddy foot paths in the fields and getting a motorized vehicle up there is probably out of the question. I must say that walking barefoot on these trails is much easier than using slippers (which most Filipinos wear). My slippers broke up on the mountain and I ended up waking barefoot for most of the day. I still ended up with mud all over me because it seems like my balance is not what it used to be with a heavy bag on my back. I can’t imagine carrying 100 kilos on my head and walking these muddy trails. I was amazed while walking back into town from the vegetable fields, seeing these large baskets being used to transport all types of stuff. I saw concrete blocks in them, grass to feed livestock, and the man above was transporting bread for his store. The surrounding area of Mantalongon is beautiful and on top of the mountain range is the highest peak in Cebu, Osmena Peak. From the top you can get a feel for the unique landscape of the area, jagged peaks and limestone cliffs. You also get a nice view of Cebu’s surrounding islands.